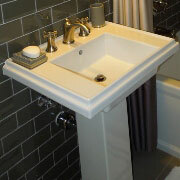 Come to us with your bathroom remodel ideas, and we’ll build on them together and create a solid plan. Next, our design professionals at ProSource® of Columbia will help you find the materials and resources you need to bring that plan to life! If you already have a design solidified, we’ll point you in the right direction and answer questions about certain materials and styles. Whether your client is looking for a pedestal, wading pool, or vessel bathroom sink, we’ll provide styles and materials that will inspire them and the bathroom’s overall design. We have many colors, types, shapes, materials, and price ranges to choose from. Who knew bathroom faucets could be so fun? 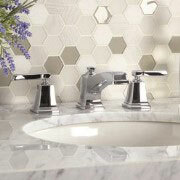 Handle types like a cross, knob, lever, or oval will all elevate the aesthetics of your client’s bathroom. These minor bathroom fixtures can do a lot to create a spa-like bathroom in your client’s home. Even the bathroom should reflect personal style, though it should be functional. Shower remodels are an excellent way to infuse style and function together when you use our accessories, products, and expertise. 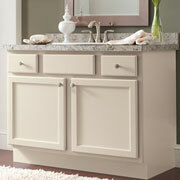 Get the storage space you need and the chic style you crave when we help you choose bathroom vanities. We have a whole host of styles to choose from to meet your client’s needs and budget. Transform your client’s space with a bathtub remodel fit for royalty. 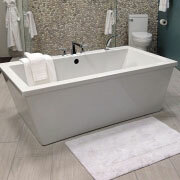 Whether they’re looking for a statement tub with claw feet, a useful shower-tub combo, or a relaxing jacuzzi tub, we can help. 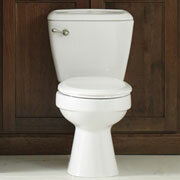 New toilets should never be overlooked in a bathroom remodel. We can help explain all the different types, styles, flush ratings, and flush mechanisms out there so that your client can make an educated decision.